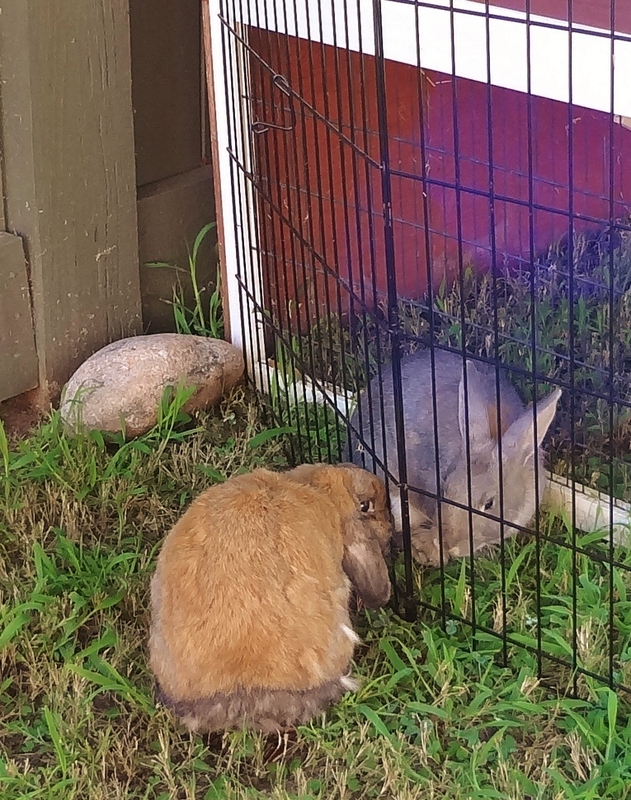 There is still no progress on the bunny love connection. We can’t even get a “like” or “tolerate” connection here! Rowdy, why won’t she like me? Do I have bad breath? 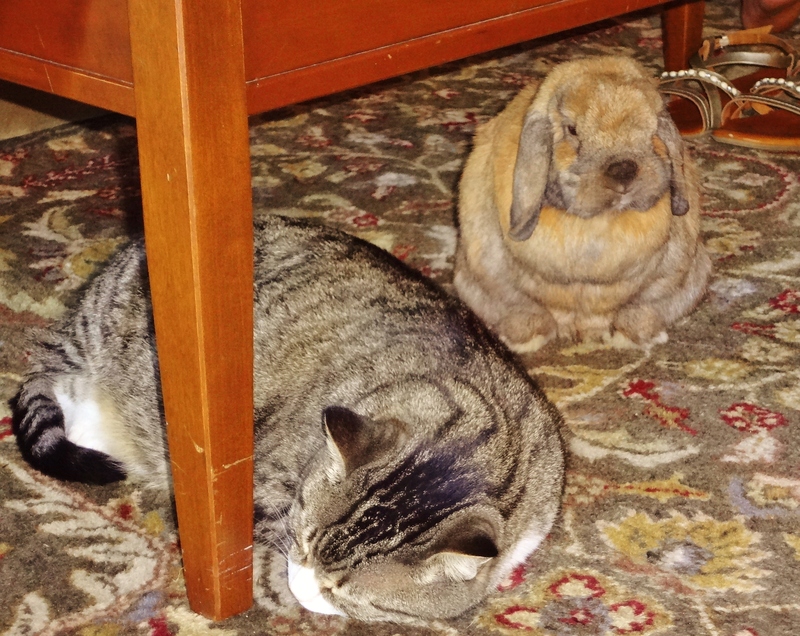 No silly bunny, your breath smells like carrots. 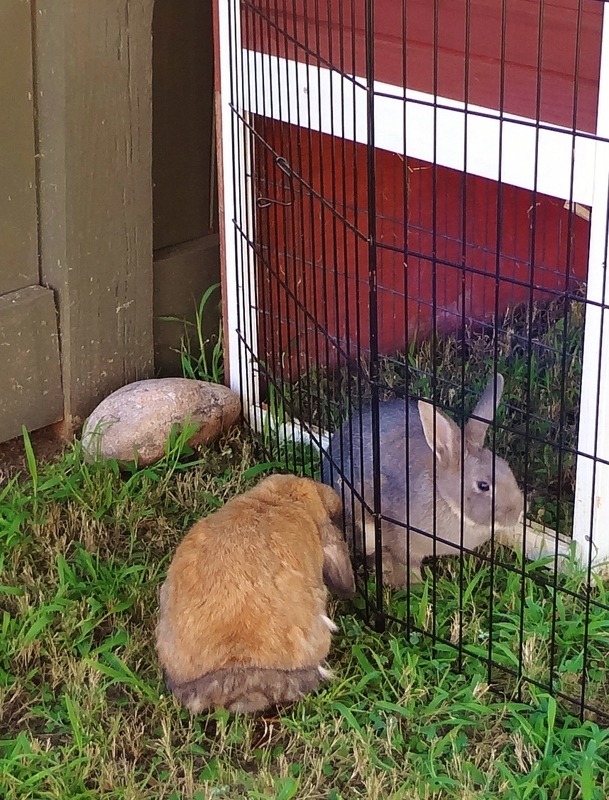 The weather has cooled off a bid here in Central Hades Alabama, so the buns spend some much-needed outdoor time every day. Of course I have to keep Graycie behind bars lest she hurt my old man. She taunts him even thru her barred cell, and he seems to relish the opportunity to show off his hard-earned freedom. OK, maybe I like you just a LITTLE bit. Take THAT you old brown bunny! LEMME OUTTA HERE, I WANNA FIGHT TO THE DEATH! Well, maybe not to the DEATH, but when they do come in contact, the fur does fly. 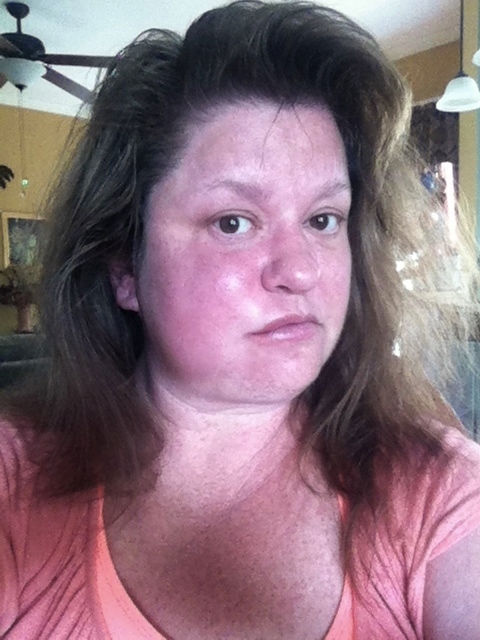 So my giant wasp-stung face reduced in swelling after about 24 hours. 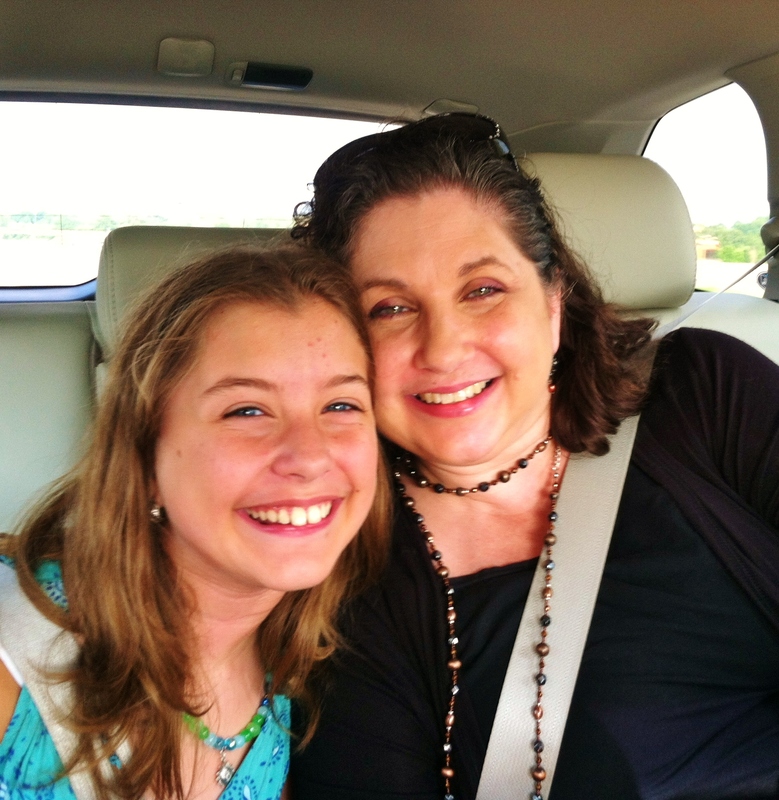 Just in time to welcome an old college pal and her daughter for a weekend visit. Alexandria is an animal lover extraordinaire, and she was in hog heaven playing with my critters. She even found Mr. Speedy! 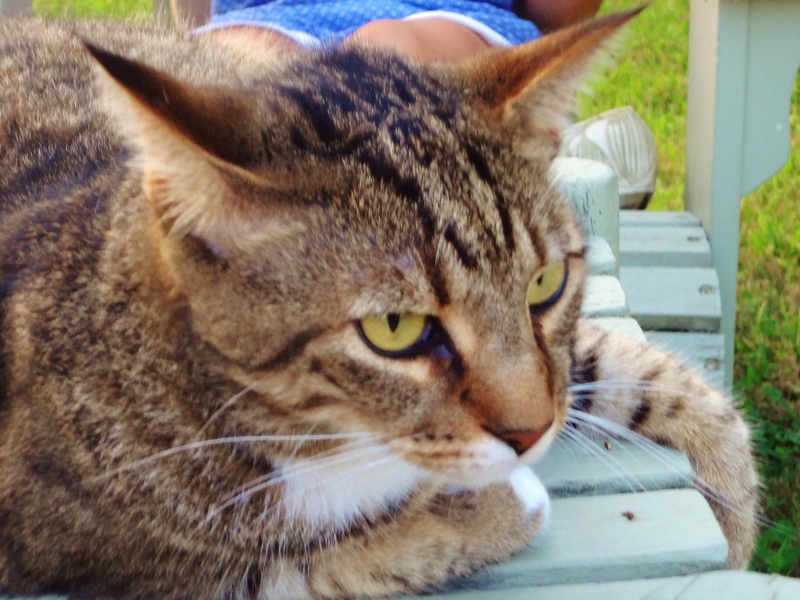 OK, Sammy, you want to know why there are so many more photos of your show-off sister Rowdy in my blog? 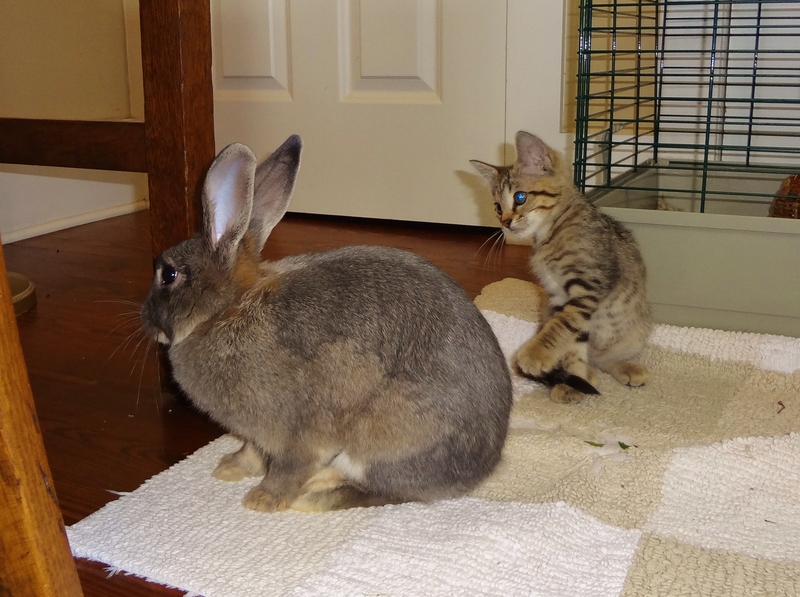 Kitties, Bunnies, Chickens & WASPS!!! You’ll have to wait til the end for the punch line. First let me tell you how my day started. I finally figured out a good place to keep Graycie until I can get her adopted to a good home. 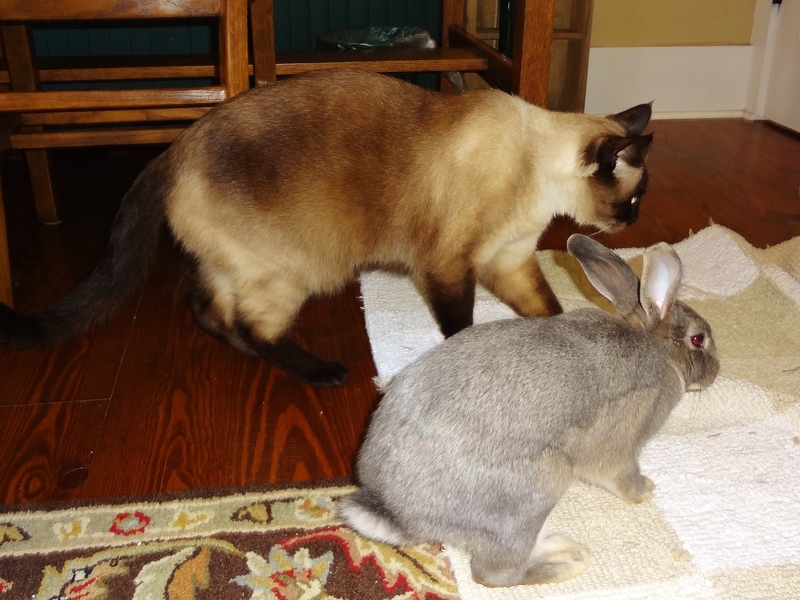 The Buster/Graycie experiment is not working and it’s also upsetting Buster a lot. 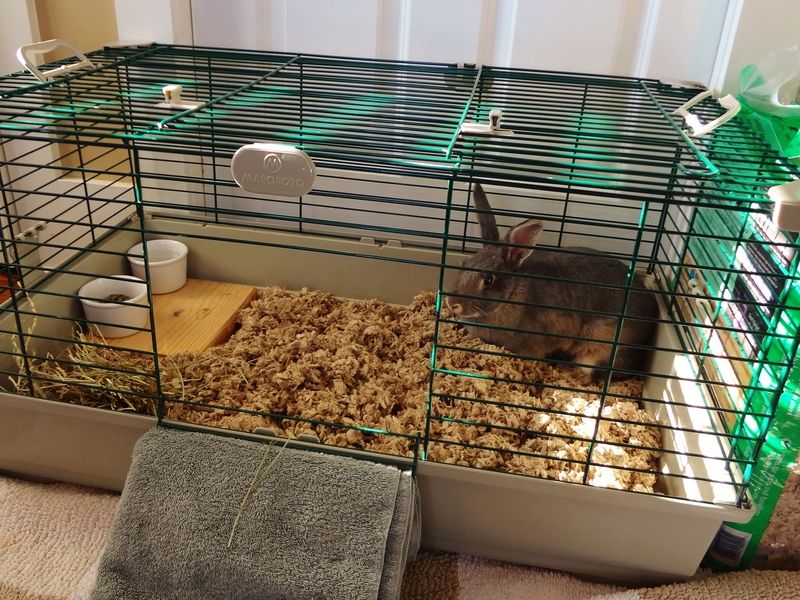 He’s started trying new places to pee instead of his litter box, and this is an indicator that he’s very unhappy with a new bunny in the house, and he’s marking his territory the only way he knows how. So I put Buster back in his beloved laundry room AND we’ve stopped trying to introduce Graycie to him. He immediately went back to his good litter box manners and he seems back to normal. 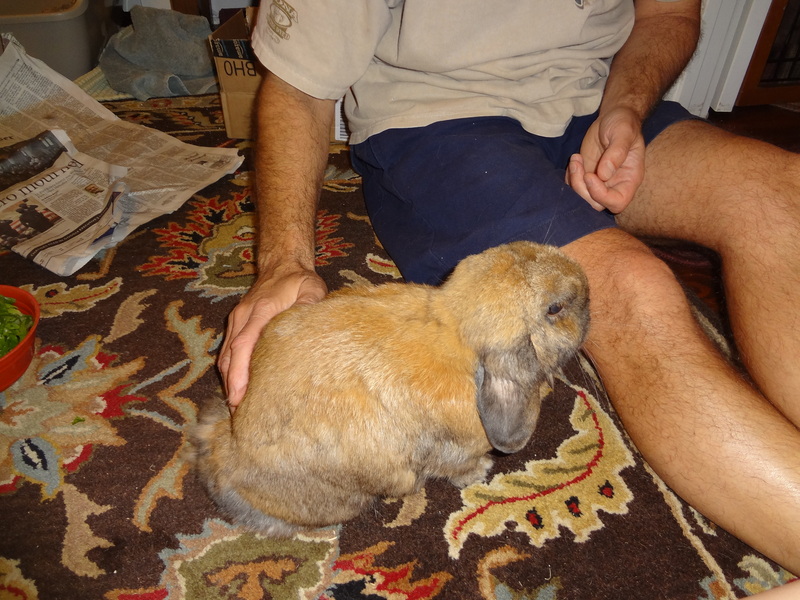 Buster is old now and I’m never going to try to bond him with another bunny again. 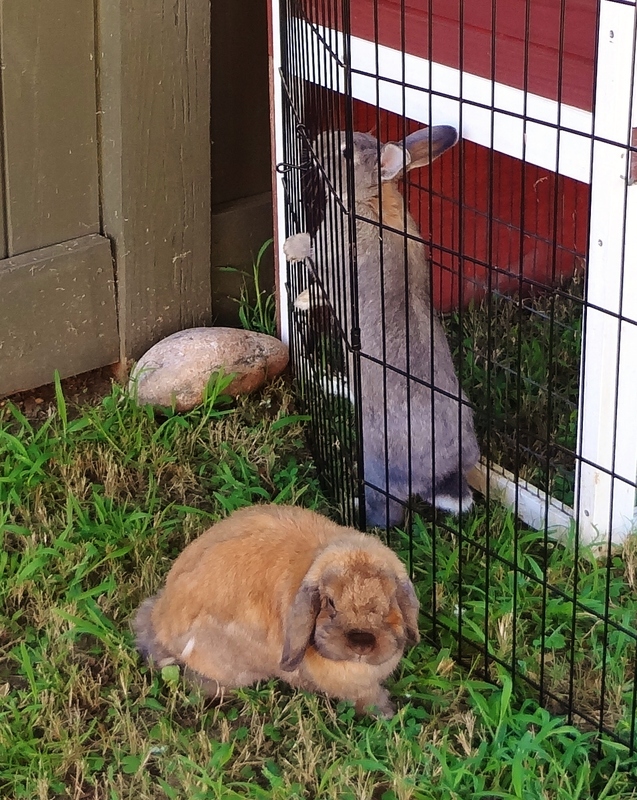 If I foster buns in the future, I’ll just keep them out of his sight and smell. Which brings me to the habitat I made for Graycie yesterday. It has all the essential bunny accoutrement needed for a happy, healthy House Rabbit. Old piece of carpet, water jug, pellet bowl, wicker basket for chewing, hay, more chew toys, cubby cardboard house & litter box. Thanks to my pal Susan for providing the doggie fencing. 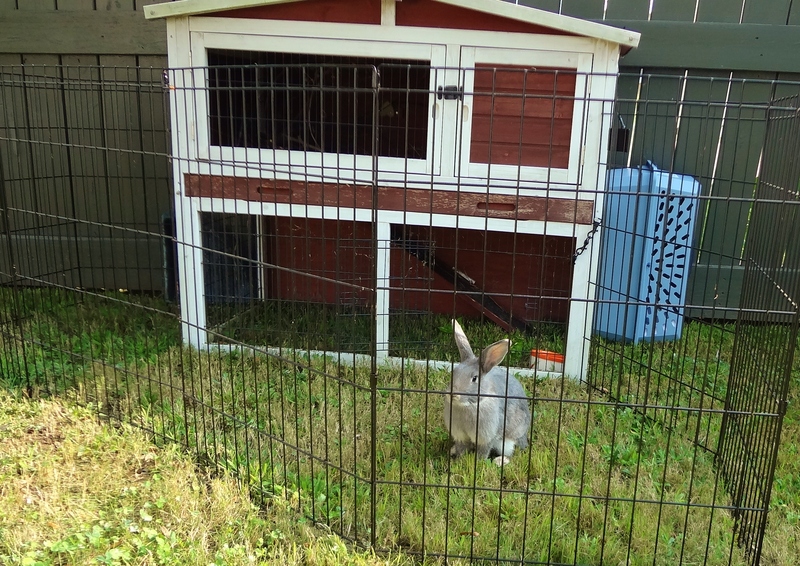 I used half of it for inside and the other half for the yard so Graycie could enjoy the outdoors in safety. This green stuff is called what? Grass??? Grass is awesome! I even let her cruise around the yard while I walked behind her. I’m pretty sure this is her first experience with the outside. A whole herb garden just for me??? 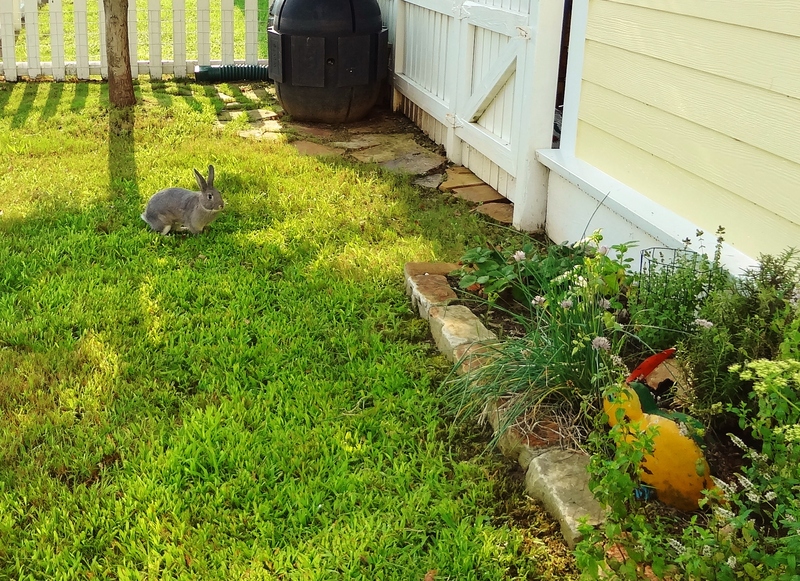 Of course Buster runs around in the yard all the time and Graycie was envious of his freedom to roam. 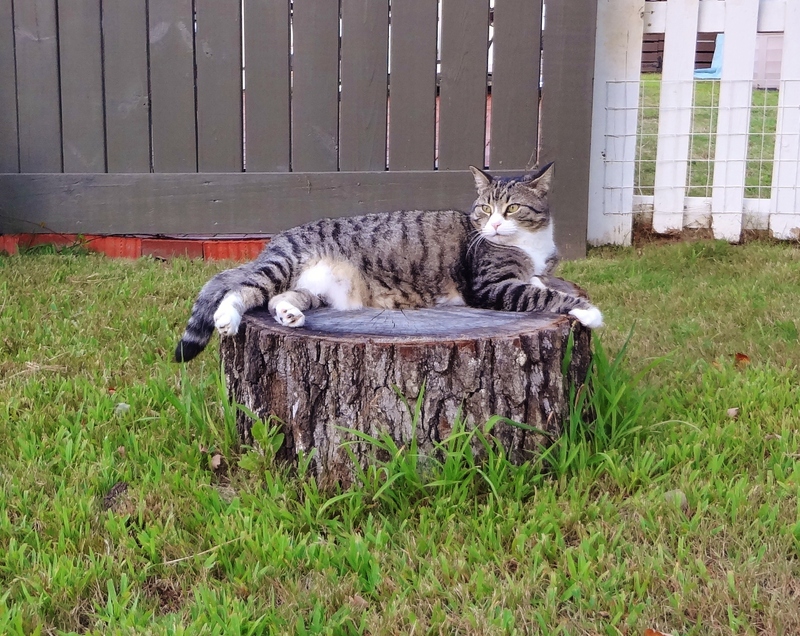 This is MY yard! My roses, MY ivy, MY rock! 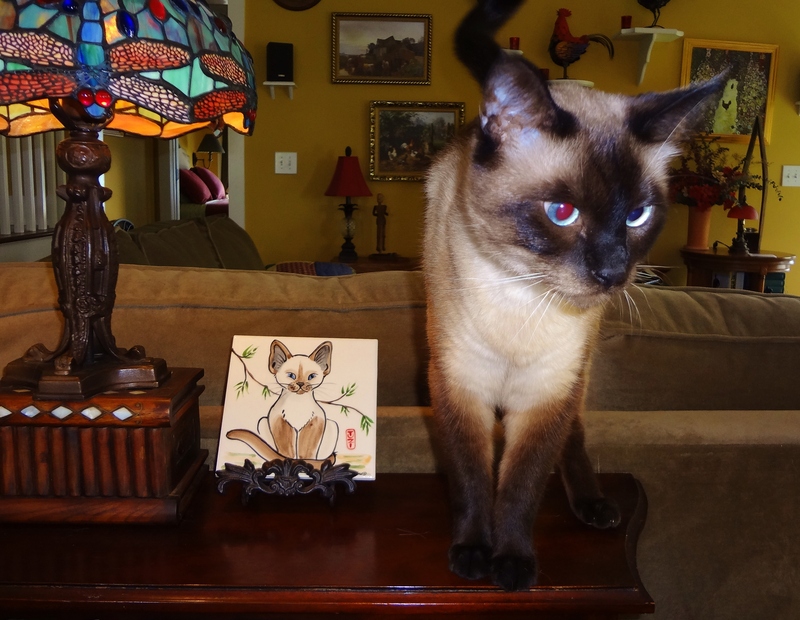 Try to be a bit more gracious with our houseguest Buster! 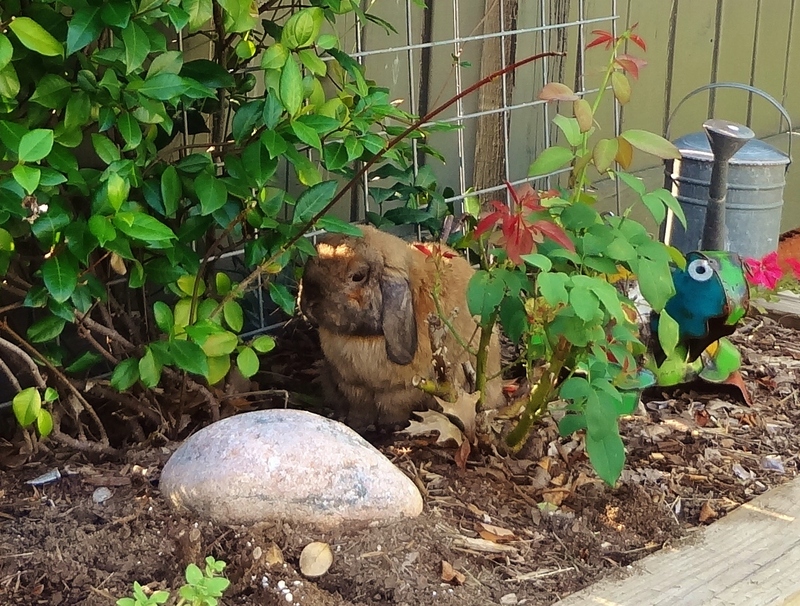 So with the animals happy in their safe environments, I began trimming my overgrown shrubs. A project I started yesterday, I was looking forward to finishing it today, and then mowing the yard and cleaning up my filthy house for my houseguests who are arriving tomorrow for a weekend visit. I actually love sweaty yard work and was weirdly excited to get my shrubs looking all nice and tidy and beautifying my casa to show off for my visitors. I trimmed shrubs for about 90 seconds when I felt a searing pain on my cheek. Having been stung by wasps many times in the past I recognized that feeling immediately and rushed into the house to cut a potato. CUT A POTATO you say? Yes, you see, just this week I had read a comment on our neighborhood FB page about applying a cut potato to a wasp sting immediately after it happens. It’s SUPPOSED to kill the pain and stop swelling. WELL GUESS WHAT??? That must have been a MAGIC tater, because this sting hurt worse than all of my other wasps stings COMBINED! Within 10 minutes one side of my face looked like Vito Corleone, and the pain was pulsing and fierce! I’m not normally a baby about this stuff. I’ve been attacked by a mamma foster cat, (still have a scar on my ankle), been bitten by two moccasins, (0ne cottonmouth, one water) and as I said, been stung by a squadron of wasps, but this sting started to scare me when my ears started tingling, and I developed hives on my chest and arms. I’ve also had cancer twice, and had natural childbirth (I do not recommend this to ANYONE!) I say all this not to prove that I am an Amazon queen who is impervious to pain, but to tell you that this wasp sting made me want my MOMMY! I did the next best thing and called Jim. He came home from work, and drove me to the Urgent Care. The doctor said I was having a mild reaction and that as long as I could breathe and my throat wasn’t closing up, I was probably going to be fine. Easy for him to say. 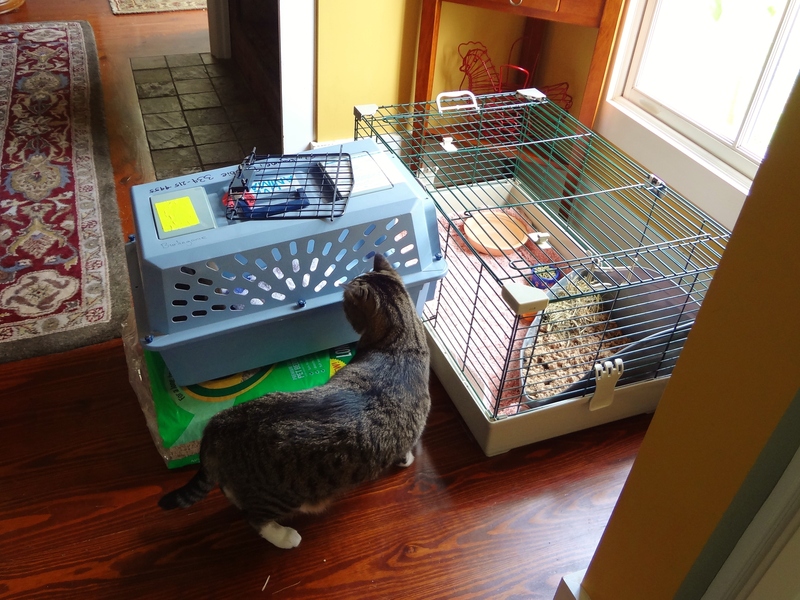 Quasimoto was entertaining houseguests within 24 hours! He gave me steroids and Benadryl in an IV and said to go home and take a snooze on the couch for the rest of the day. Actually I am home and feeling much better. The swelling has gone down considerably and the pain is almost zero. I should be groovy by tomorrow morning giving me time to prepare for visitors, but Jim is going to have to finish those DAMN shrubs. Please pardon my French but I WILL NEVER TRIM SHRUBS AGAIN AS LONG AS I LIVE! The lovely necklace of hives adds even more “Ooh La La” don’t you think? So I wish you all a happy & “wasp-free” day. I must go now. I have an appointment with daytime TV, a comfy couch & an assortment of steroids, Benadryl and Advil. Jealous? A few weeks back I was posting a lot of turtle rescues. 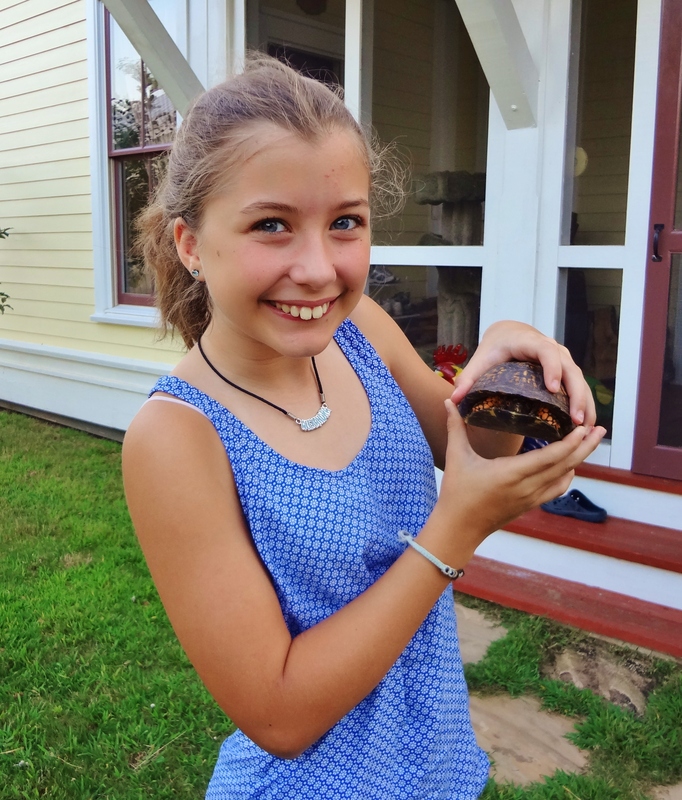 It seemed that at least once a week I was finding an injured turtle in the road and bringing them to my back yard to recuperate. Some of them stayed a while and some disappeared into thin air. My back yard is fenced and although it’s not impossible for a turtle to escape, I just couldn’t see where it was happening. 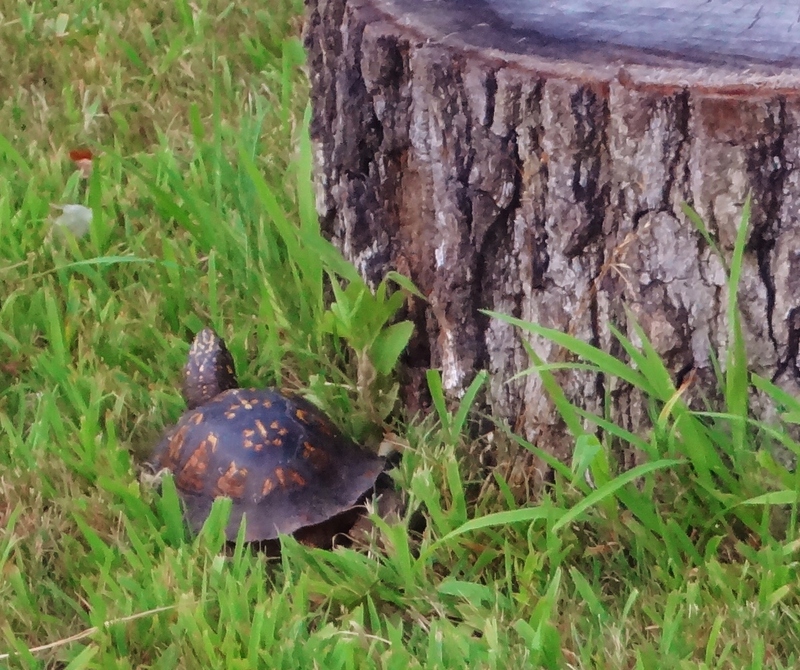 The last rescue was a water turtle (only slightly injured, not serious) and a box turtle who was completely unharmed. I let the water turtle go in the lake in front of my house and put I put “Speedy” in the back yard to live on our animal farm. I never saw Speedy again. I assumed he was one of the great escape artists and that he had found a way to freedom. Then about 4 weeks later, I saw his bad self strutting across the back yard with his head held high. 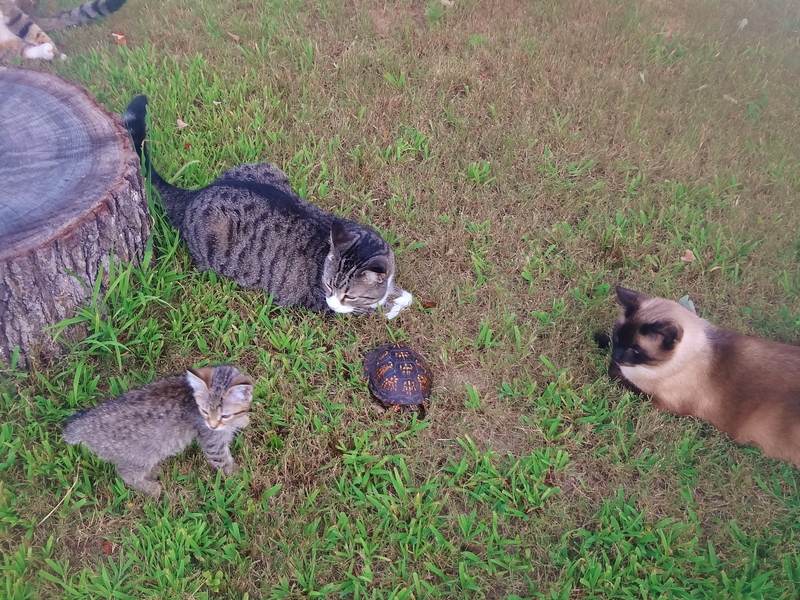 All the critters were curious about him so we had a little photo shoot. Bobbi Sue could not understand the “moving” rock. I could not figure out where this guy lived for so long without being seen. I finally found his secret hideout while I was filling a water bowl for the outside critters. He sure picked a pretty house. 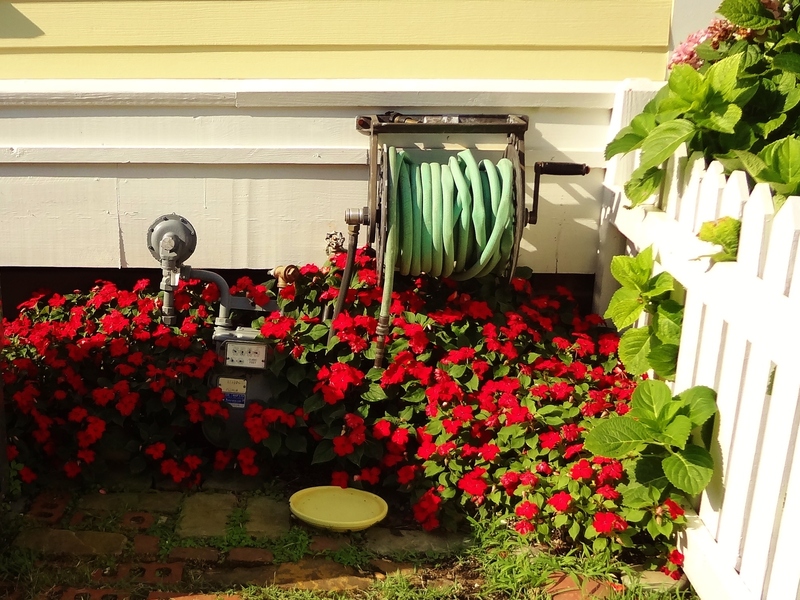 Speedy lives behind my impatiens. I keep them watered very well so he has a dark, cool, moist house on hot summer days. He drinks from the shallow yellow bowl and eats slugs from the underside of it. Yum! 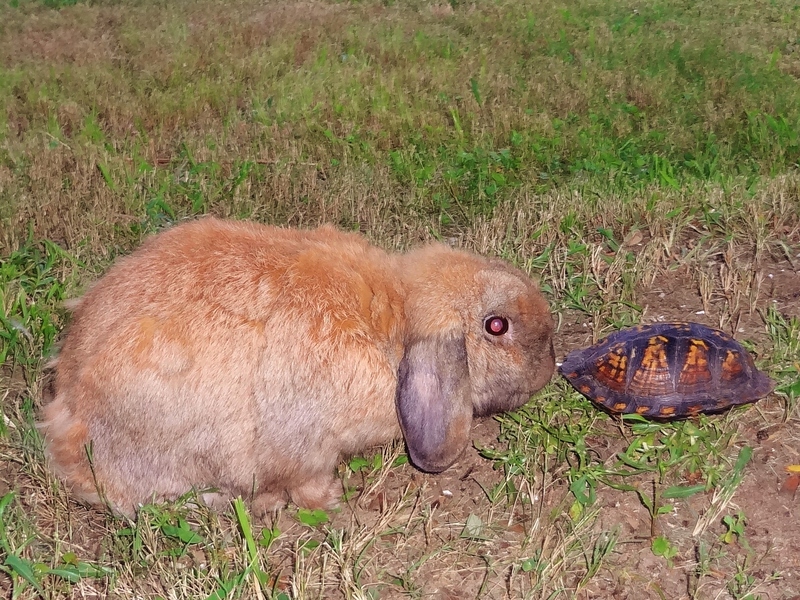 No Rowdy, this guy just cruises the yard in search of tasty slugs and tender greens. You’re safe big girl. 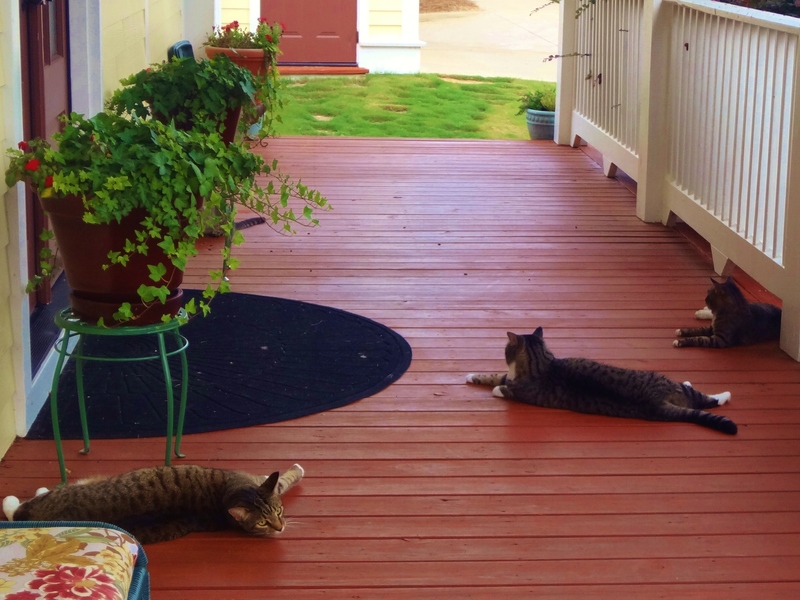 Speaking of “safe”, GT has decided that our porch is a pretty chill spot to hang out. 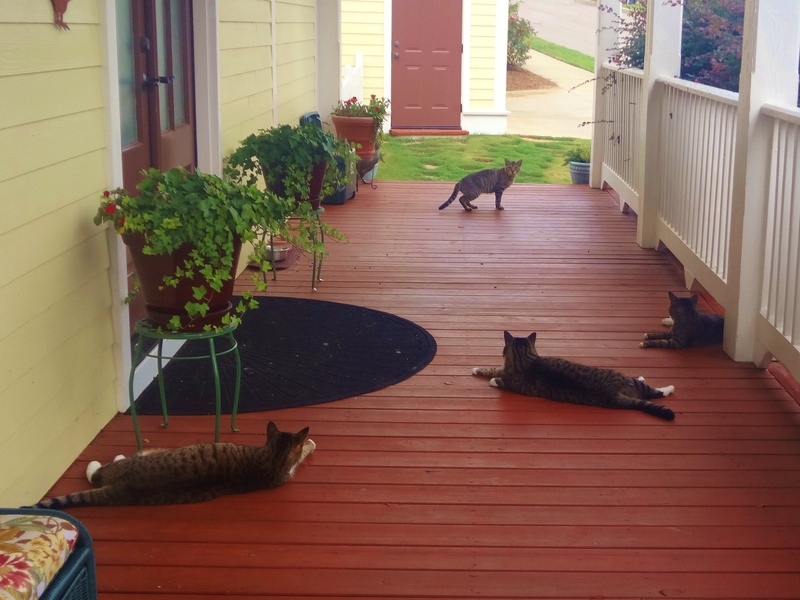 He’s gotten used to our cats and you can regularly see him stretched out next to an assortment of Burlingame animals. Shortly after I took this photo, a mystery kitty snuck up to the food bowl to grab a snack. Should we chase that guy? Naaaaa, it’s too hot. I’m also having some success in taming the old guy. 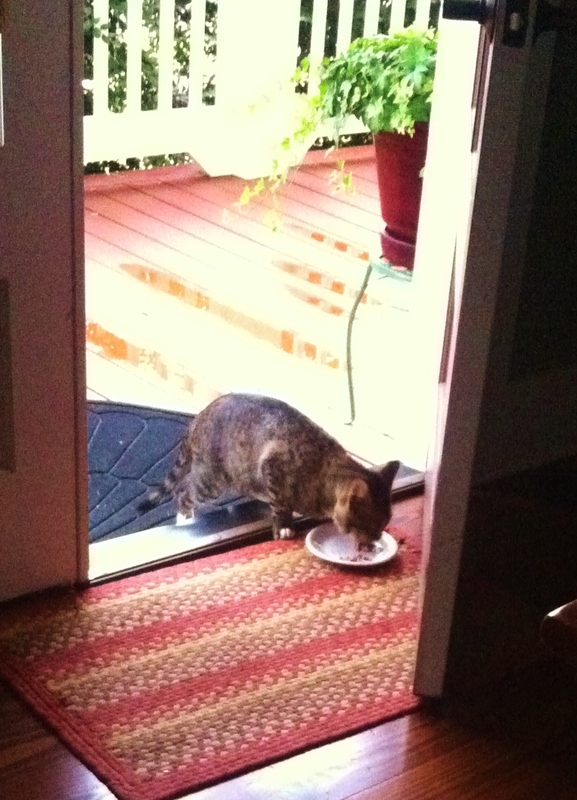 I put his breakfast just inside the dining room door now and he nervously comes just inside to eat in the morning. 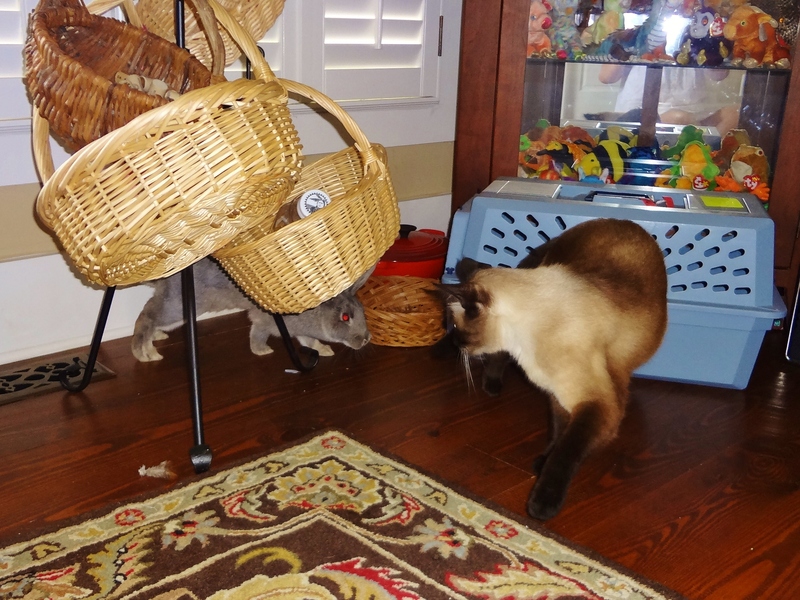 As for our foster creature, Graycie, things are not going too well in the area of making friends with Buster. 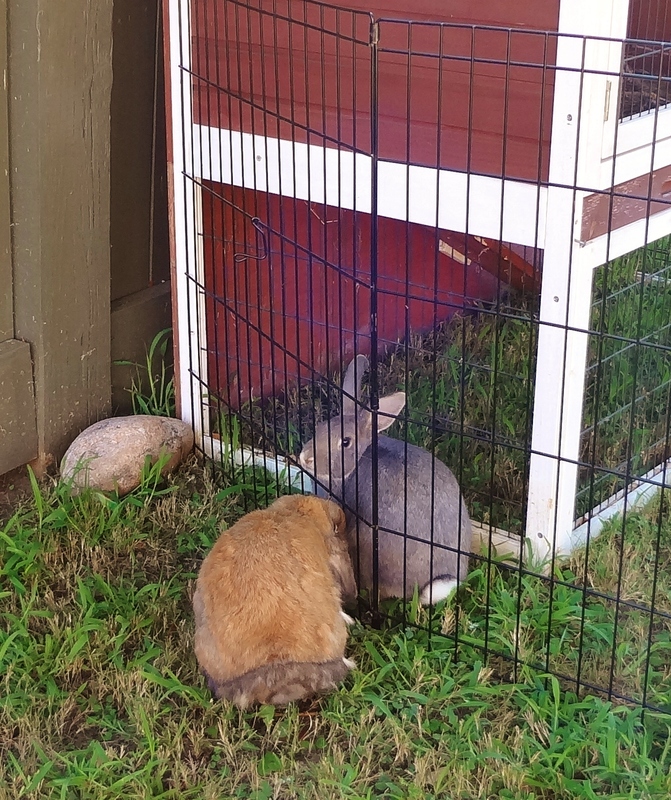 More on this later, but for now, we have to keep them separated since she will not succumb to the charms of our sweet old Bun. He’s just not my type. 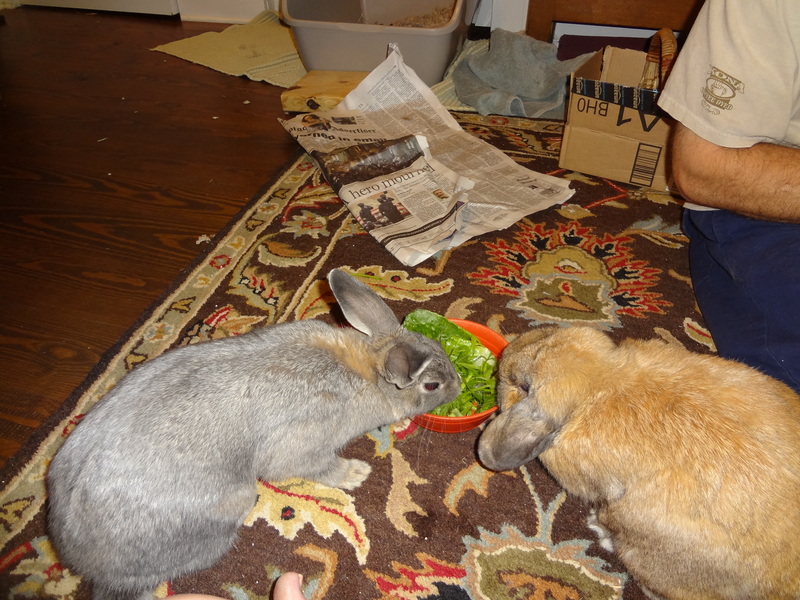 Lastly, here are a couple of creatures who came over for dinner this week. 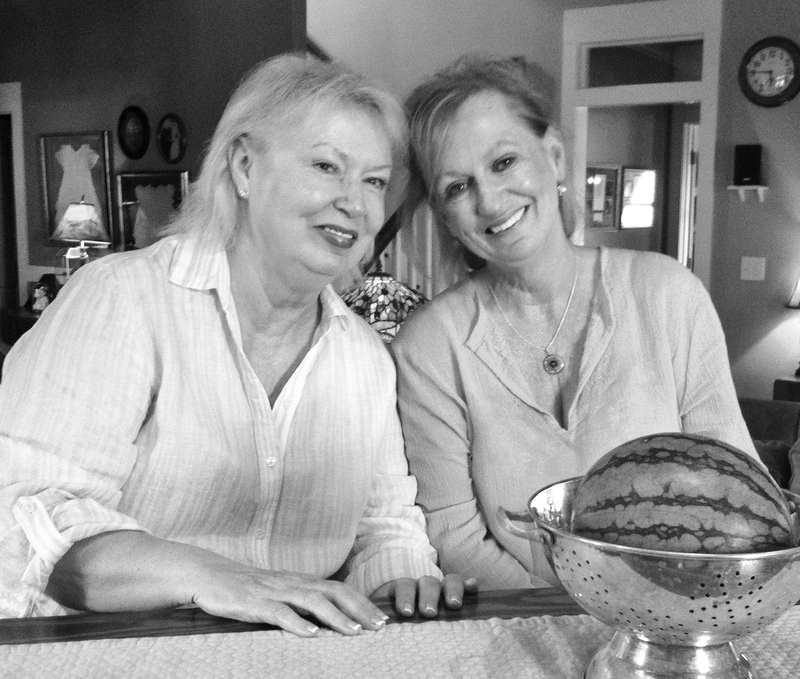 Susan, aren’t so SO proud of me for not making a joke about “watermelons”? It took every ounce of restraint I had! 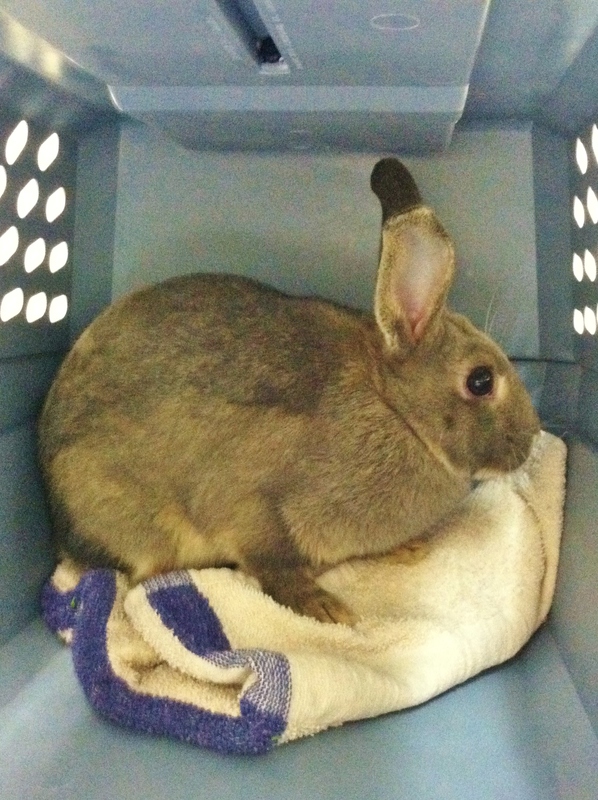 I go to the shelter at least once a week to replenish bunny supplies and check on the new buns up for adoption. 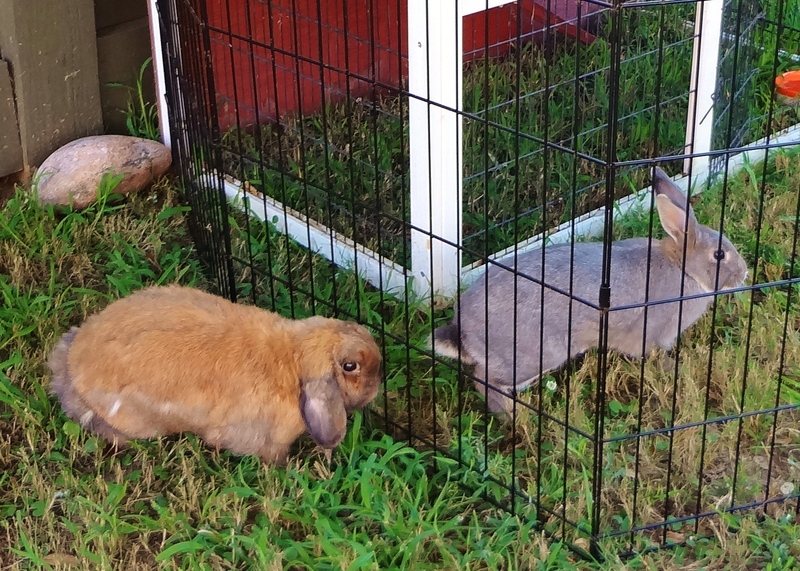 I really do not like to see bunnies at the shelter because I know they were bought at a pet store on impulse, by a parent who relented to their child begging for a cute pet. 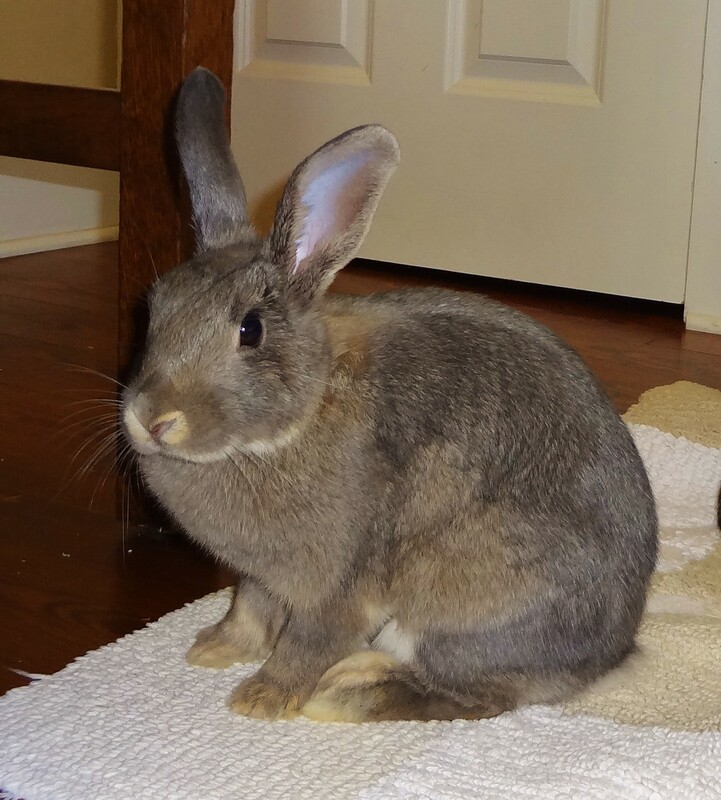 Bunnies are GREAT pets and wonderful additions to a family, but most people have no clue what is needed to keep a bunny happy & healthy. 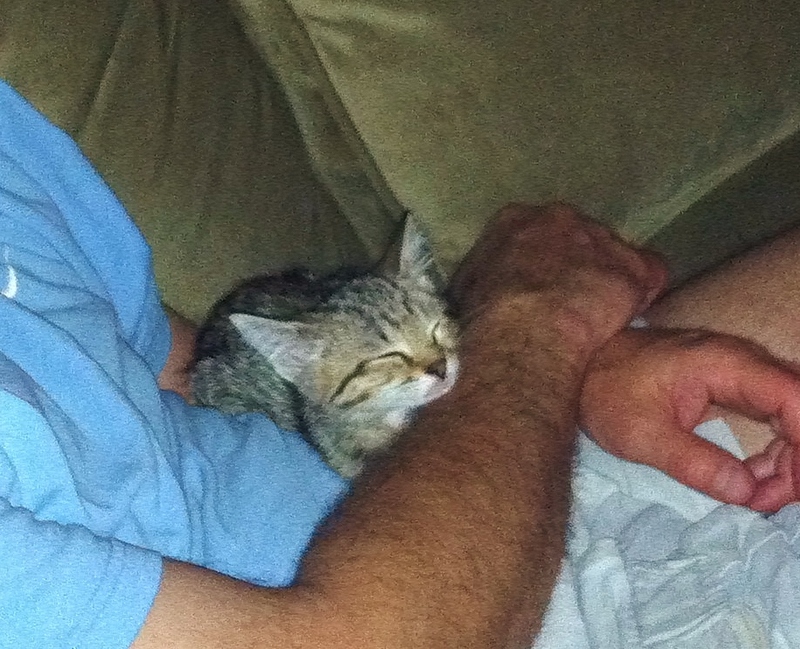 I’ll talk more about this subject later, but for now I’ll tell you about my new foster baby. 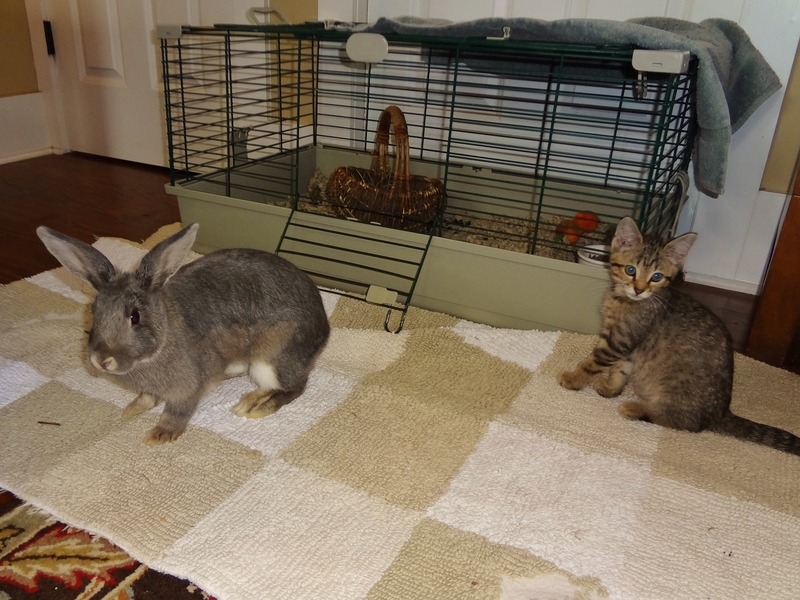 At the shelter, Graycie was placed in a cage with her pal Freddy. 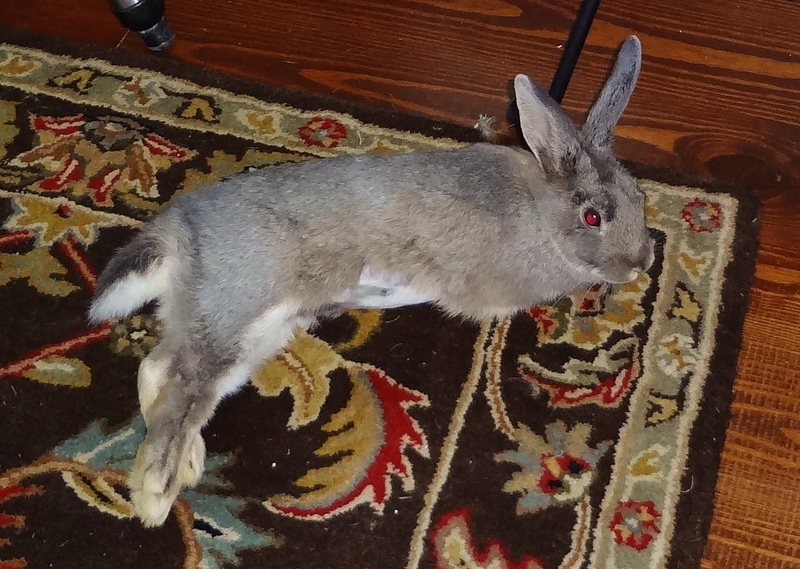 Freddy is an old un-neutered male bunny with floppy ears, fluffy black fur and apparently enough libido left in his elderly bod to impregnate a female. 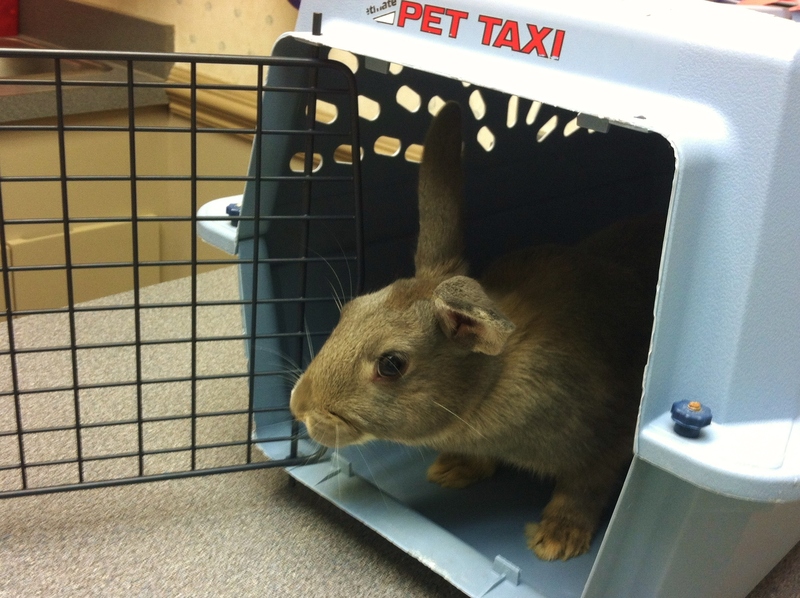 Another pet peeve of mine–ALL PET BUNS SHOULD BE SPAYED OR NEUTERED REGARDLESS OF RISK OF PREGNANCY!!! 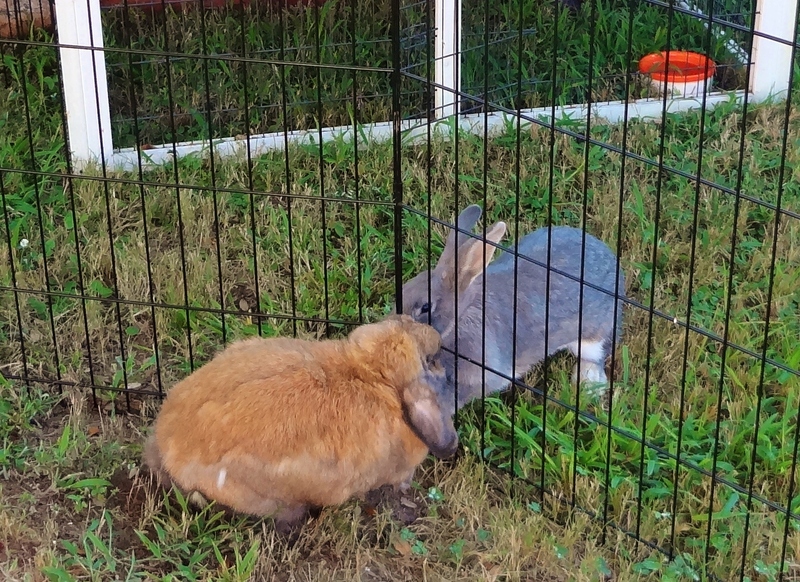 Breathe, Debbie, breathe…OK, I’ll calm down and explain the rest of the bunny drama now and try very hard to reserve my frustration for another post. 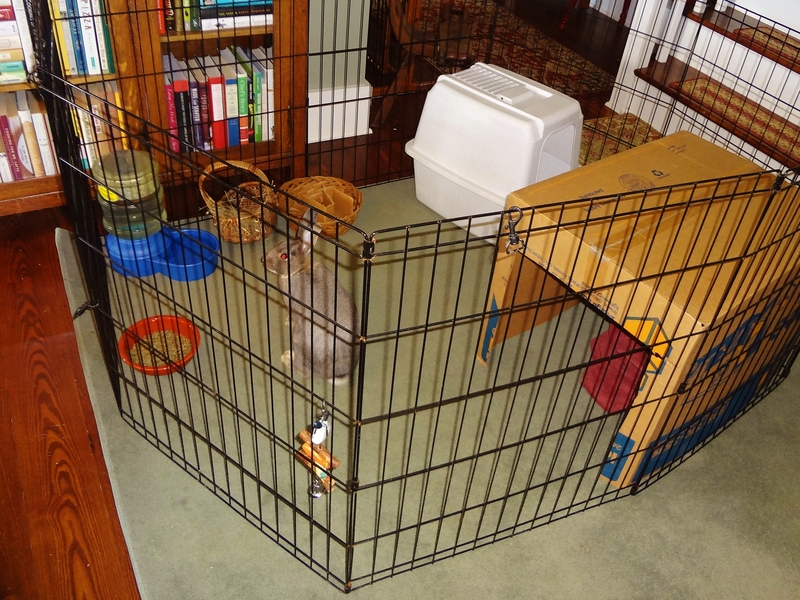 I bring Graycie home and let her transition from the carrier to her temporary cage at her own pace. 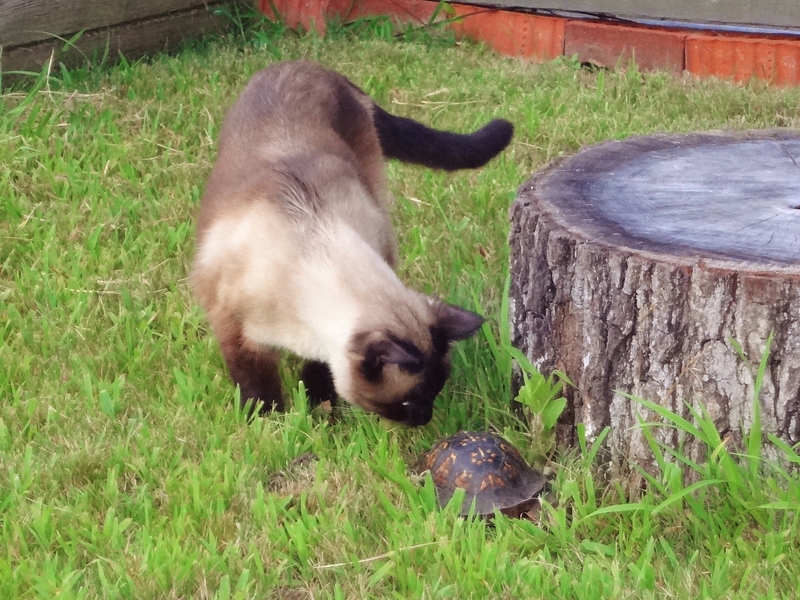 Rowdy was very curious about the new visitor. Graycie had to spend the night with me prior to surgery since I had to have her at the vet before 7:30. Here she is waiting to meet Dr. G. the next morning. OK, maybe I’ll just check things out. 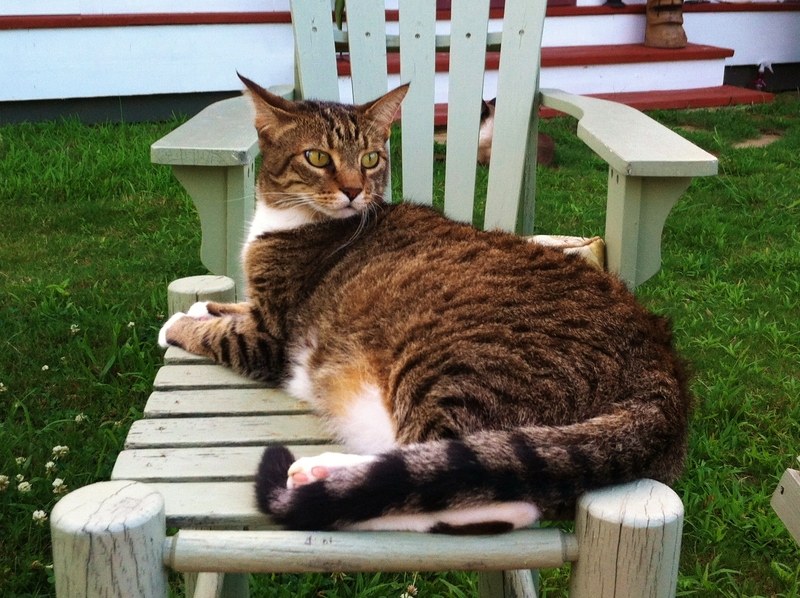 The surgery went well, and Dr. Glasscock said her pregnancy was so new, that the procedure was not anymore involved than a regular spay. So I took her home that afternoon and had her recovery center all ready for her. 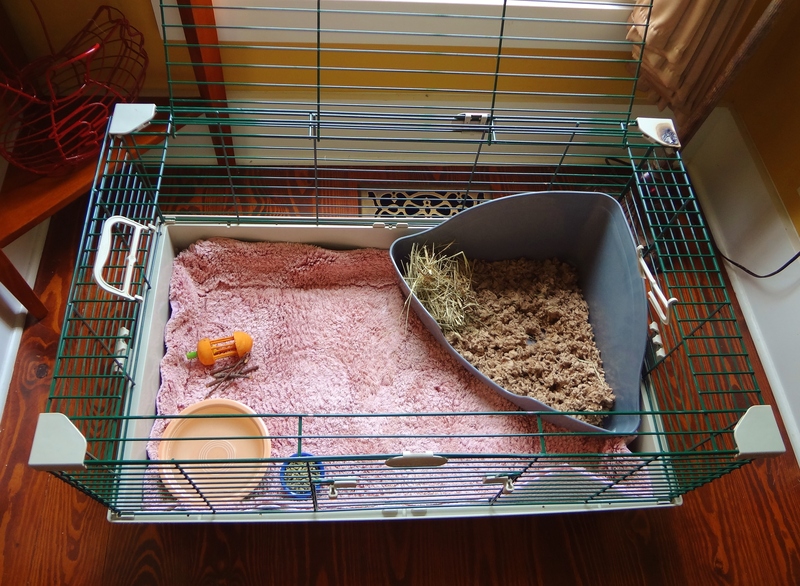 litter box with hay, water bowl, pellets, chew toys, soft rug–Check! Later we moved her cage to the office where we could shut the doors but leave her cage door open in case she wanted to stretch her legs. Also, I took out the litter box because she just seemed confused by it. We’ll work on litter box training after she feels better. 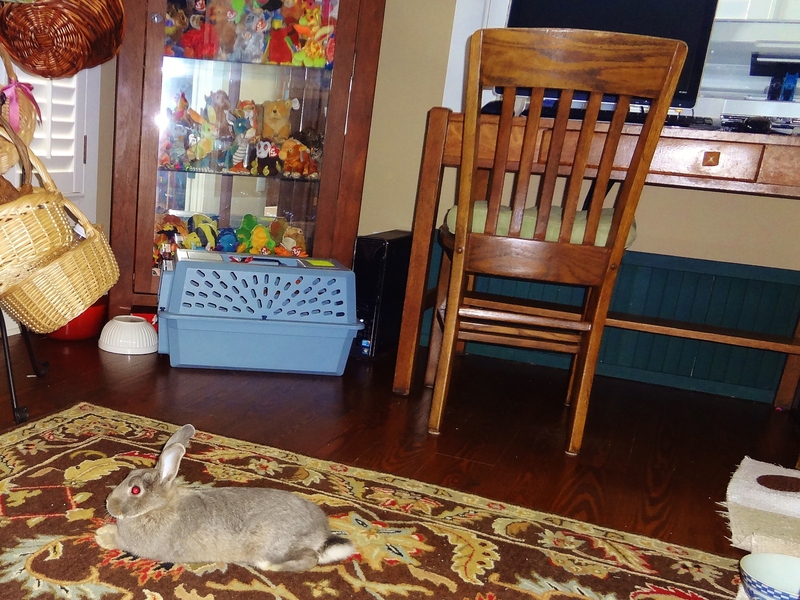 Plus bunnies usually just pick a corner to pee & poop in because they’re very neat and tidy animals. We left her alone for the night and gave her some pain medicine just before bed. The next morning she looked happy and curious, so I let her have a visitor. 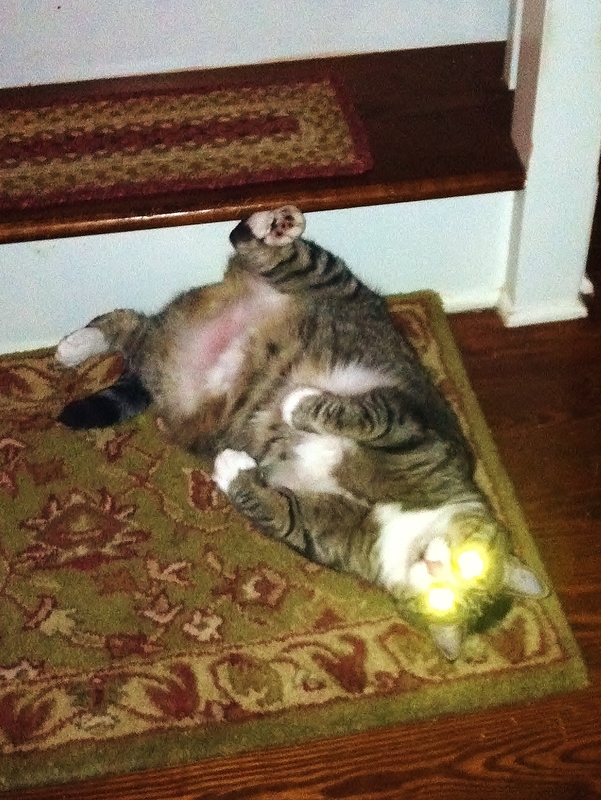 This is a weely funny lookin’ cat! My name is Bobbi Sue, how do you do? 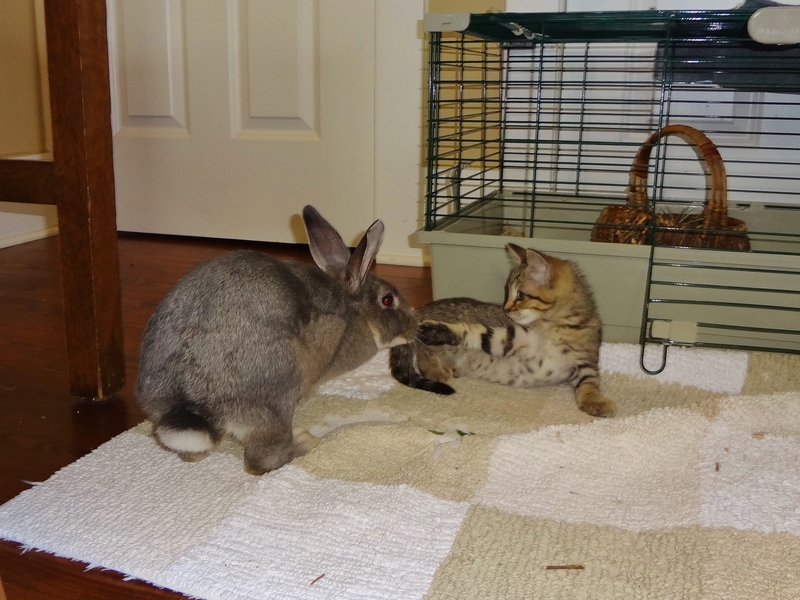 Later another curious kitty wanted to meet the new bunny. Mr. Mulder, meet Miss Graycie, I think you’ll like her. 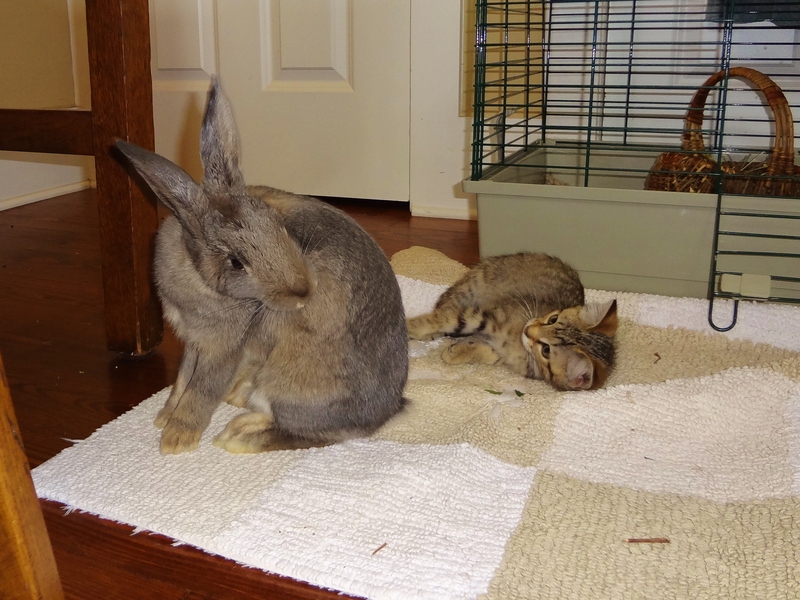 More on my new foster pet and more on Bunny education if you can stand it. I plan to use my blog and some other social media to find this fabulous young lady a forever home. 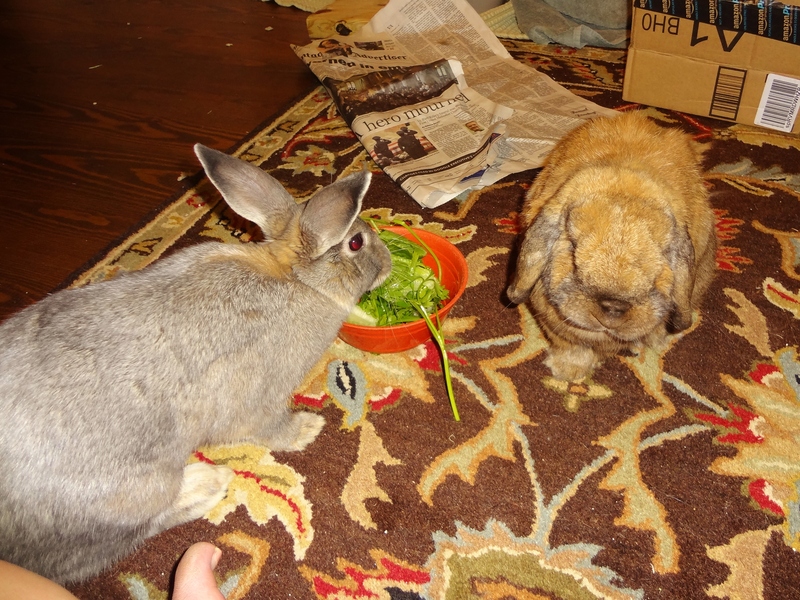 Until I do, we’re going to have lots o’ fun with brand new bun! I have a new “animal” in my house for a while. I was going to make a post about her this morning but while I was downloading and editing pictures, I found some unpublished pics of Bobbi Sue, so forgive me for lingering on the subject of my last foster pet, I could not let these go without sharing. 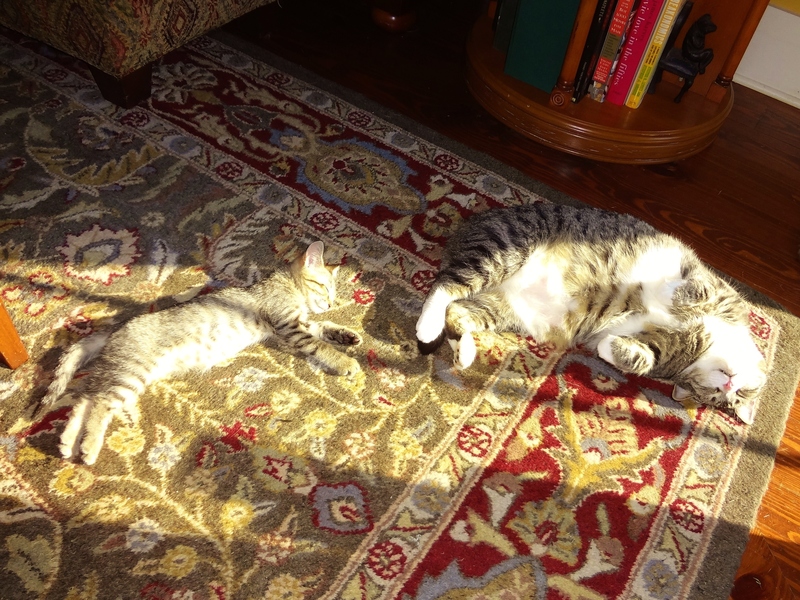 Rowdy actually got to know Bobbi Sue a bit and taught her about the magic of relaxing in a sunbeam. 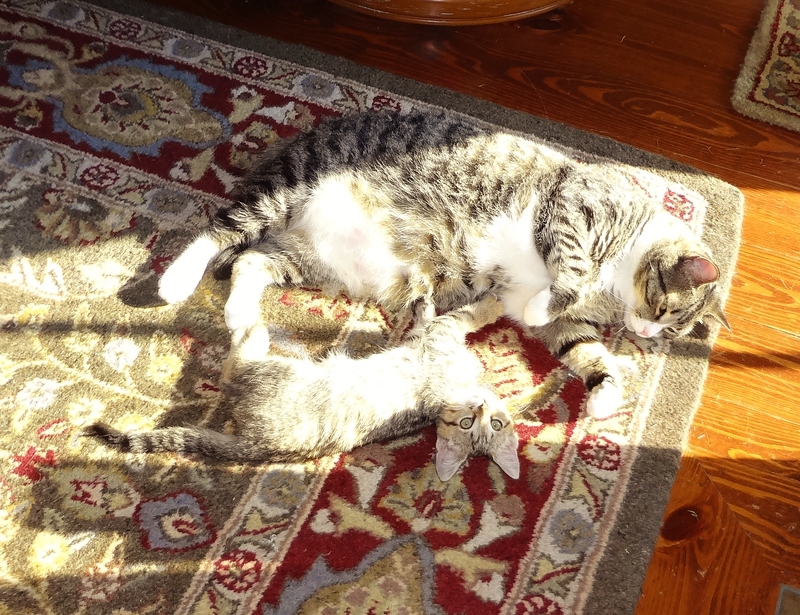 She eventually let this little one snuggle with her once or twice. There is NO softer place than a Rowdy tummy. 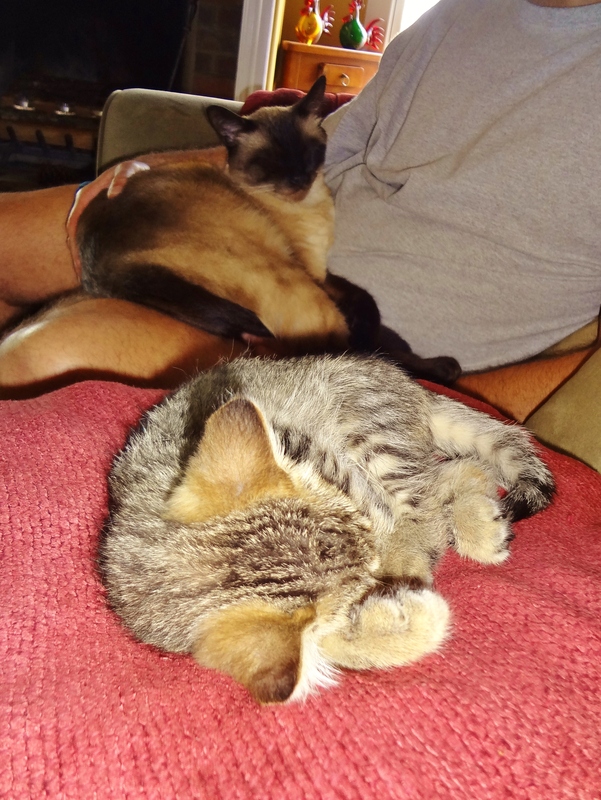 And here are two more pictures of Jim and Bobbi Sue sleeping on the couch. 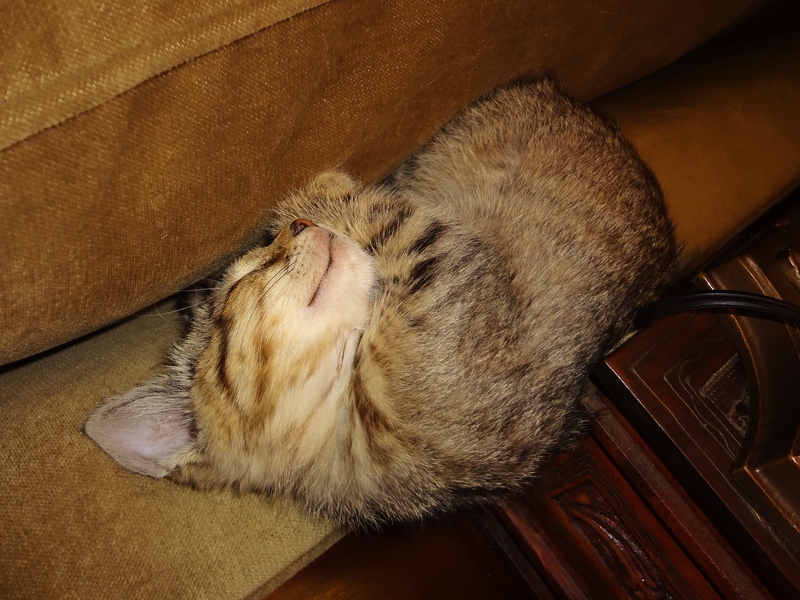 I could fill an album with photos of Jim sleeping with foster kittens on the couch and it would be THE BEST PHOTO ALBUM EVAH! It’s long been his habit to spend the foster’s last night having a sleepover on the couch and this was no exception. I can’t promise these are the last photos I’ll share of Bobbi Sue, but for now I’d like to introduce you to my new foster critter. I’m getting my little foster baby ready for her trip back to MHS. This one is particularly hard because Bobbi Sue really carved a niche in our hearts. 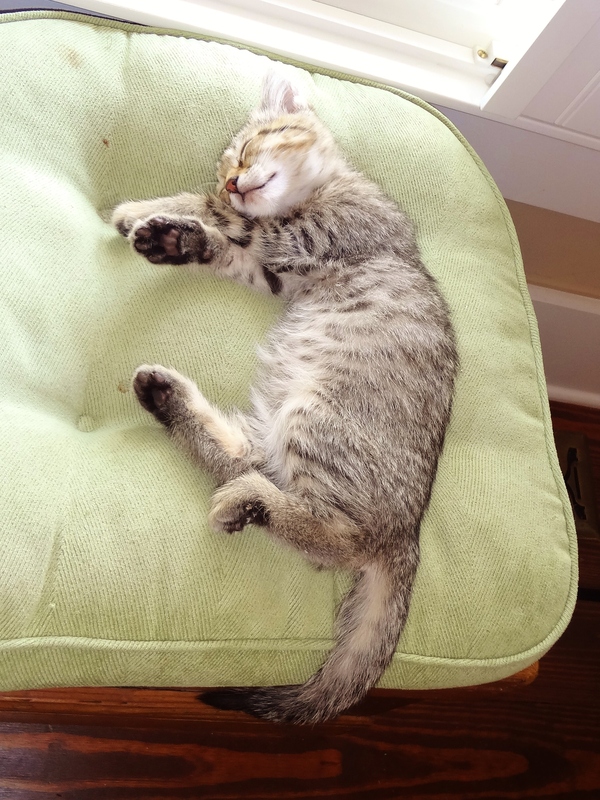 She’s one of the most relaxed and happy kittens we’ve ever had in our home. We will miss her very much. She really made herself at home here. 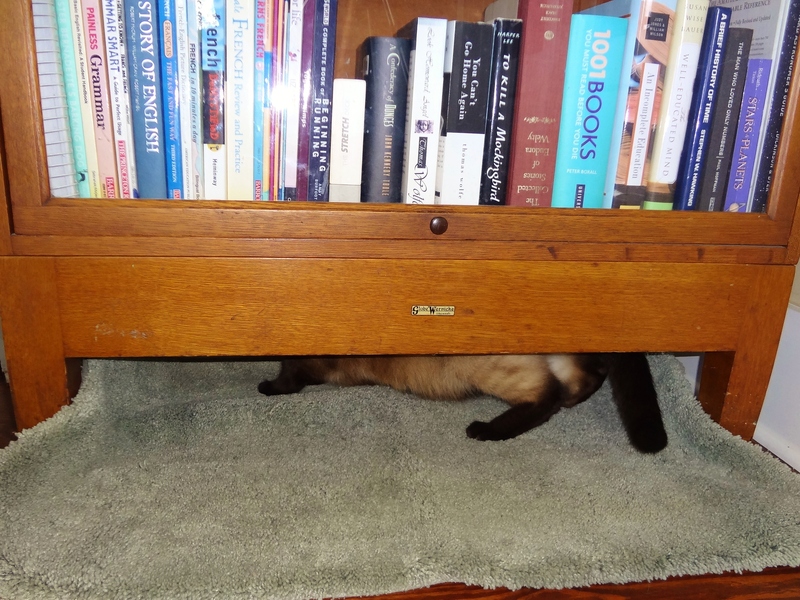 And found so many nice places to take a cat nap. 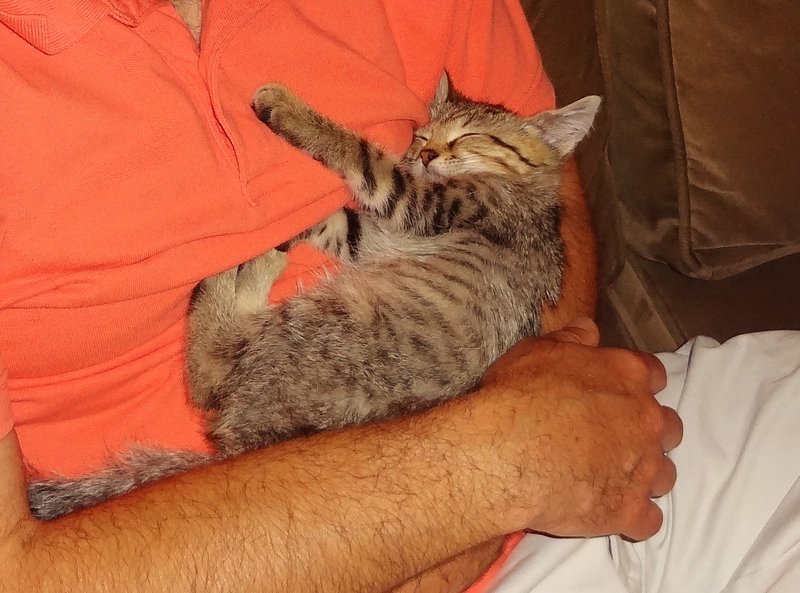 Her favorite place was Jim’s lap unless it was already occupied.